Hurstmere’s Year 8 football team celebrating their victory in the North West Kent Cup . ENRICHMENT WEEK Enrichment week will be taking place during the last week of term (w/c 17th July) here at Hurstmere. There are residential trips to Windmill Hill (Year 7) and Paris (Year 9) which will be departing on Monday 17th July. For other students (Years 7 - 9) there will be lessons provided which will be an extension to the usual curriculum that is taught. All pupils should have received a letter regarding the enrichment week. If you have not received a letter please contact the school office who will be happy to assist. Pupils will be expected to attend during normal school hours (8.30—3pm) and in full school uniform (PE kit when needed). There will be some off-site activities available which will enhance and enrich the extended learning opportunities during this week. The times of these trips will be communicated to you within a letter along with all other key information needed regarding the trips by w/c 10th July 2017. As always we are delighted to showcase some of the latest activities and developments from the vibrant Hurstmere community. Students in all year groups supplement their considerable efforts in lessons with an involvement in a varied programme of lunchtime and after school activities. I should like to take this opportunity to thank the teachers and support staff who complement their programmed work with the devotion of many hours to make the extra-curricular offer so valuable to the students. wish them well for their onward journey into Further Education or, for some, the world of work. In addition I should like to thank those colleagues who are moving on this August. Their work and efforts at Hurstmere have been much appreciated. I would especially like to congratulate Mrs O'Keefe (Teaching Assistant) and Mr Simpson (Assistant Principal) on their respective retirements, and assign particular good wishes to Mr Day, who started at Hurstmere some thirty years ago and who has secured a post close to his home in Kent. There have been further productive meetings of the School Council and of the form representatives of specific houses. Welcome to the second instalment of the Hurstmere House report, which is keeping you up-to-date with your house’s progress in The House Competition. Timetabled drama Thanks to the site supervisors for the soap in the toilets A second snack shack in the lower school playgrounds The election of next year’s house captains took place on May 24th in Citizenship. In addition Miss Parris’ literacy quizzes – which have again earned big points for Chaucer and Caxton – a number of new competitions have started up and are allowing your house to earn points toward the final house prize. Mr Walters has run a number of competitions in his Science lessons, including Year 7 Parachute Design and Year 7 and 8 Bridge Building. Caxton house gained the most points in these contests. The Comic Relief Joke Writing contest saw a win for Chaucer who submitted the most jokes that tickled Mr Maher’s ribs. Caxton and Chaucer tied in the high tariff Attendance Week contest where as the Accelerated Reader standings saw Chaucer out on their own at the top of the table. The summer term will see the culmination of the house competition on Sports Day but there will be plenty of opportunities to get your house in contention for the big prize by earning house points in the weeks leading up to that event. some of the more junior boys at the next event. Special mention has to go the four House Captains: Caxton's Simeon Norman; Chaucer's Josh Horak; Cobham's Callum Owen and Sidney's Joe Jeffery. All of these leaders ensured that all events were filled and showed a great amount of dedication towards their teams. Congratulations to all boys who competed. Thursday 22nd June Field Events and Wednesday 5th July Track Events - There will be information about these events in the next edition of this Newsletter in September 2017. Wednesday 27th June - The results and a write-up of this competition will be in the next edition of the Newsletter. On Friday May 26th 18 Year 7 and Year 8 pupils had the opportunity to visit MCM London Comic Con. This trip was a reward for their attendance at Comic Book Club and their enthusiasm for improving their literacy skills. The boys and the staff wore a variety of costumes to partake in the fun. The most popular costume of our group was worn by Mr Duff dressed as the Nostalgia Critic. Comic Book Club will continue next year, so if you enjoy reading comics, drawing comics or even just talking about them, then come along and possibly you could be at the next Comic Con London! Some of our comic book enthusiasts join the Ninja Turtles. How about learning a little more French? Or a new language even? Lingualift.com has listed the following apps in their top 10 best language learning apps. Why don’t you have a go? Once again Vocab Express has proved to be very popular amongst learners of French across all five year groups. The learning website is a great way of consolidating our boys’ knowledge of all vocabulary and grammatical structures studied in class. Vocab Express is also available as a mobile app for iOS and Android. Download it for free now and learn on the move! Our Red Nose Day 2017 fundraising efforts raised a total of £192. The boys submitted quite a few jokes for the Joke Writing Competition. The top joke writers were Luke Doyle (Y8), Max Connor and Ben Mackinnon (Y7). Special thanks go to the PE Department for organising the one mile run and to everyone who helped raise money. Thank you again for your support. Hurstmere’s latest trip to Iceland took place in the first week of the Easter Holidays with 53 Year 11’s visiting this wonderful country. It was a truly amazing week. The boys had a fantastic time visiting and seeing some incredible scenery but we had some vary variable weather with snow, sheet rain and sun. The trip really was one that they will never forget! But don’t take my word for it, here are some snippets from the diary of the trip and some quotes written by the boys who went. Day 1 amazing was our wonderful guide Rocky calling us back to the coach with a rendition of the Jurassic Park and Star Wars theme tunes played on his trumpet; I think we all realised what an amazing and magical place we were in as we excitedly made our way back to the coach. On a beautiful Sunday morning faces appeared at the school gate, bags packed, tired but excited, anxious about what lay ahead of them. An assortment of bags were loaded into the coach and minibus, pupils were shepherded on board, we waved to emotional (and happy) parents and we were off! After a long wait at check-in, where Icelandair failed to appreciate that there might be a number of school trips going to visit their fair country, we finally all got checked in and saw our luggage disappear. Unfortunately, as we were to find out once we landed in Reykavik, one boy’s bag had decided not to travel and this left him stranded without any clothes! Once there we made it through customs successfully, without the teachers suffering too many panic attacks that we'd lost our passports, we met our wonderful coach driver Rocky, who had been our host on a previous trip. This gentleman has more talents than just coach driving as we were to find out later. After a short drive we reached Lucky Bridge, the bridge between the continents where we crossed from the Eurasian Plate to the North American plate. Back on the coach we made our way to Reykjavik keeping our eyes peeled on the hauntingly beautiful landscape as we proceeded to Hotel Cabin - our home for the night. We got settled into our rooms and then prepared for a cold walk to get food. Luckily, the Hamburger Factory turned out to be fantastic, the food was awesome - what more could we ask for day one?! Joseph Hannaghan was dreaming of his case arriving soon! The boys had a whip round for some spare clothes, and everyone went to bed tired but content. and unique experience. Hearing the roaring water cascading down right next to me was unforgettable.” Said Joe Marsh. On the journey back to hotel for the night we stopped and went to take a walk along Reynishverfi, and the black volcanic beach which did not disappoint. The teachers wouldn’t let us anywhere near the sea but then we saw the huge waves for ourselves! It was incredible albeit slightly scary. Whilst some of us enjoyed playing on the beach, others were amazed by the basalt cliffs and caves. After settling into our new rooms, we ate dinner and got ourselves ready for another day. A few boys made the cold run to the Hot Tub! When the teachers told us we were going to visit a lava field I thought they’d gone mad. You don't understand how interesting the lava fields are until you are wandering around them. At first it looks like a gigantic, green field but when you get close you understand why they are such a big attraction in Iceland.” (Dan Harris). On we went to Jokulsarlon Glacial Lagoon. The boys had great fun trying to break lots of the mini floating icebergs, whilst Mr Simpson tried to take some artistic pictures of the ice. The wind was howling now and the boys tried to lean as far into the wind without falling, whilst the coach driver was getting worried about the driving conditions. Back to base to finish the quizzes tonight. We’re not judging you teachers, we promise… By now we actually were all exhausted so gave the teachers an easy night and actually went to bed and to sleep! Oh and Joe Hannaghan’s bag arrived!! vehicles knowing we were going to be crossing land that hadn’t been touched since the overnight snow. It looked truly stunning. The Thorsmork Valley can only be described as a winter wonder land. The valley was basically a river with cliffs on each side which made the atmosphere very calm (apart from the constant snowball war zone that a few of us had created). When I wasn't under fire, I couldn't help but stare at the shimmering icicles and the thick dusting of snow that covered all the really perilous places between the covered rocks. The river, on the other hand couldn't have been more spectacular. The water rushed and meandered around us and the taste, although a little sour, puts tap water to shame. Back on board with Rocky one last time and we were heading for our final destination: Keflavik airport. Everyone thanked the driver, and George Oldfield did a great job of thanking everyone involved with organising the trip. Mr Baston commended the boys on their excellent behaviour. We then checked in at the automatic check-ins and were on the plane before you could say Eyjafjallajokull. After being informed about which exits to calmly make our way through if the plane happened to crash, we jetted off back to London with memories that we will never forget. We spent time learning and exploring areas of the island that are not very accessible to most tourists. The area is very intriguing due to the fact that it is constantly changing because of the diverse weather and constantly shifting glaciers. We also got to visit and learn about movie site locations such as ‘Interstellar’, ‘Batman Begins’ and ‘Noah’. This place just keeps getting better! With stomachs rumbling, we were bundled back onto the coach and made our way to Hotel Cabin in Reykjavik and a return visit to the Hamburger Factory. Fantastic! SPORTS NEWS minutes on each of the eight different golf challenges. Each school were also awarded a team score for demonstrating Life Skills such as 'Teamwork, Honesty, Safety' etc. The overall winners were Old Bexley Primary School who will now go on to represent Bexley at the Level 3 School Games Finals in July, whilst Birkbeck won the Skills for Life Award. The Year 9's did a great job giving coaching points at each challenge and making sure the children had as much fun as possible despite the weather. The Sports Leaders were a credit to Hurstmere. SPORTS LEADERS Hurstmere Sports Leaders have continued to volunteer their time to provide sporting opportunities for other young people from a range of schools across the borough. They have run a range of School Games Level 2 competitions, supported the delivery of the Junior Leadership Academy and Multi Sport Club as well as hosting Sherwood Parks Level 1 School Games competitions. Sherwood Park Level 1 School Games Competitions Sherwood Park has been working with the PE department this year to provide their pupils with the opportunity to engage in a range of Level 1 (Intra School) School Games competitions. Utilising the facilities at Hurstmere they have been able to hold competitions in hockey, basketball and football. Sports Leaders from Year 10 have supported the Sherwood Park teachers with the organisation of these events and gained valuable experience in officiating a range of sports. The Junior Leadership Academy has run throughout the year for children in Year 6 and 7 from Birkbeck, Dulverton, Holy Trinity, Sherwood Park, Hurstmere and Chislehurst & Sidcup Grammar school. The aim of the Academy is to extend young people’s leadership skills and support them with volunteering. Hurstmere Young Ambassadors and Year 10 Sports Leaders act as mentors for the Academy Members acting as advisors and sharing their experiences of volunteering. It is great to see young people all working well together and supporting each other’s development. So far the academy members have organised a Change4Life Festival for children in Year 3/4 which focused on fun physical activities and at the end of June they ran a Multi-Sport Festival for Year 3/4 to help them develop their fundamental skills. When not at the Academy the children volunteer in their own school to support the delivery of lunchtime and after school clubs, helping other children to engage in sport and physical activity. 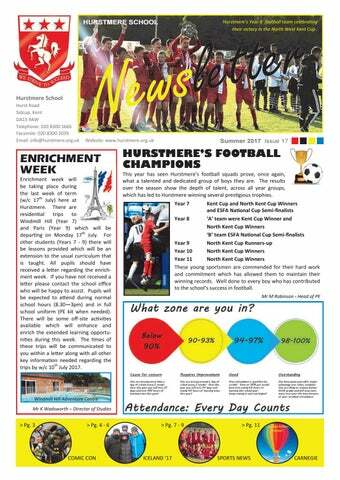 Hurstmere Multi Sports Club Report By Ed Barnes This term, Year 8 Sports Leaders hosted a Multi Sports Club for primary school students of Years 5 and 6. The club spread over two sessions which both lasted an hour. 12 children from Sherwood Park, Birkbeck and Dulverton attended the sessions to learn new skills from different sports. Basketball occurred in the first session. One good drill to teach the children how to throw the ball took place first, followed by some dribbling relay races which boosted the children’s confidence. To finish off the session, two matches took place as the Sports Leaders gave advice to the children. Tennis took place in the second session; to start off the Sports Leaders displayed positioning tactics. Afterwards, the children played a game named ‘Tap Up Tennis’. This allowed them to practise hitting the ball gently, this was followed by floor tennis and then they were ready to play matches. This occurred when doubles matches were introduced. All in all, the club was successful. Every child had a brilliant experience at Hurstmere and the Sports Leaders are keen for this to happen more in the future. The ‘B’ team managed to reach the semi-final of the National Competition losing 4 - 1 to Kingsdale School, and have shown that the year group have strength in depth of their squads. This year has been very successful with the Year 8 ‘A’ and ‘B’ teams competing in the National Cup, and the ‘A’ team representing Hurstmere in the Kent and North Kent Competitions. Our congratulations go to Year 8 pupil Sami Salih, who represented London in the Acro National Finals 2017 at Fenton Manor Sports Complex, Stoke-on-Trent after winning the preliminary regional competition. At the Finals he and his partner were placed 3rd in the Mixed Pairs (Grade 5) Acro Gymnastics and this makes him 3rd in the UK at this level. They were judged on execution and artistry. Sami has been a member of Bromley Valley Gymnastics Club for a while but was encouraged by his parents to try Acro Gymnastics only 18 month ago. This was a convincing victory and we are looking forward to defending the trophy in Year 11, as well as attempt to win back the Kent Cup which they won in Year 8. We wish Sami all the best for the future in his chosen sport. The Hurstmere in Zambia project organised a bag packing weekend at Morrisons in Sidcup on Saturday June 24th and Sunday June 25th. Volunteers packed bags from 10am till 5pm which provided us with a great opportunity to raise funds while promoting the project throughout the community. YEAR 10 - GREENWICH MATHS TIME cases take part in. These included interactive presentations and workshops on exciting mathematical ideas, information about state-of-the-art current mathematical research, handson activities, and exhibitions. The speakers were well known in the mathematics, entertainment and business world. They included Juggler Colin Wright talking about patterns and predictions, Katie Speckles on paper folding and problem solving and James Grime discussing Enigma and the world of codes and code breaking. The boys interacting at Colin Wright’s presentation. Last year I read the book Wonder by R.J. Palacio. The book is about a boy named August Pullman. August was born with a rare facial deformity and has to have many operations and scans and as a result has always been shy about his appearance. His Mum, Isabel has home schooled him all of his life but eventually August has to go to regular school. Of course, August finds this hard as there are many pupils who make fun of him. August's interests include gaming and playing with his dog, Daisy. Unfortunately, during the story, Daisy passes away and August’s life becomes even more difficult. As difficult as life gets, August eventually finds a way to be happy and accepted by the children and parents at his new school. Over the academic year all the Year 7s and some Year 8s have been involved with Accelerated Reading as part of their English lessons. The AR programme is designed to improve the boys’ language and literacy along with helping them to ‘read to remember’. They are tested at the beginning and re-tested at the end of the year. Not only have we seen our top readers improve but many reluctant readers have, with the help of the AR reward system, taken to reading, and also improved their comprehension skills. 1 Million Words + - Abbijai Aroulradjy, Nikhil Dabhade, Shaylyn Gounder, Joseph Lally, William Leahy, Yeta Semple-Sepiso Harry Stephens and Stephen Young This Year 7 cohort has to date read 65,435,941 words which is the highest recorded word count of any Year 7 group at Hurstmere. Well done to all those boys whose hard work made this possible—keep reading! Well done to all those boys who have improved especially our Word Millionaires. for their favourite and the winner would be the book that generated the loudest cheer. The audience were happy to oblige and cheered very loudly. The winner, by a narrow margin, turned out to be ‘Salt to the Sea’ by Ruta Sepety. At this point Harry threw all the losing books, along with the boys out of the balloon and finished by saying, ‘Well what did you expect? The balloon was still too heavy and I had to save such a brilliant book!’ The audience appeared to enjoy this original presentation and energetically applauded the boys’ effort. The team was accompanied by Mrs Tubbs (Librarian) and Mrs Dowse (Assistant Librarian) who had helped the boys prepare for the event and afterwards said the boys "Did us proud". The Mayor of Bexley was a guest at the awards and during his speech he joked about not wanting to be a passenger in Hurstmere’s debating balloon! Later he told them how much he had enjoyed their clearly delivered, distinctive and funny presentation. These boys are to be congratulated as it is a daunting event for them to speak at and, like last year, we were one of the smallest groups to present so there was a lot of pressure on them. The video can be seen on our school website. Jack Playford Jack became instantly obsessed with Kayaking whilst in Year 7 at Hurstmere. By 2015, age 17, he had competed for Great Britain in the Canoe Polo European Championships, and in 2016 his team, using their superior fitness, beat their German opponents to comfortably win the World Championship. After leaving Hurstmere in 2013 and gaining A Levels at Chis & Sid, Sam was awarded a rowing scholarship at the University of Washington. Sam achieved numerous successes in rowing and athletics, including a bronze medal in the British Championships Single Scull, gold in the Ghent International Regatta 4x and he became silver medallist in the U23 High School Crash B's Indoor World Championships. Now studying at the Oxford Brookes University, Sam rowed against Cambridge and Oxford in the boat race warm-up fixtures. Following a series of injuries last year, Sam is back to fitness and will be taking part in the Henley Royal Regatta this summer, and aims to represent GB at either the U23 European or World Championships. We wish Sam all the very best for the future. Jack is currently Under-21 Canoe Polo World Champion and became top goal scorer. He has now been signed by an Italian team, with a trip to China planned for summer 2017. On a personal level, Jack feels that going from a chubby Hurstmere Year 7 to standing on a podium, with his best friends, in Sicily with a gold medal around his neck is all thanks to Mr Baston setting up the Hurstmere Kayaking Club back in 2010. Dr Robin Bunce Robin Bunce studied at Hurstmere School between 1985 and 1990. After leaving the school, he gained a first class degree in Politics and Government from Kent University and a PhD in the History of Political Thought from Cambridge University. He writes about politics and culture, and has recently published Renegade: The Life and Times of Darcus Howe, with Bloomsbury. The book, which was written with Paul Field, is the first major history of the Black Power movement in Britain, and is due to become the basis of the feature film Mangrove Nine. Robin advised Oscar Winner John Ridley on the history behind his script for his latest TV show Guerrilla. He blogs for the Huffington Post on politics, and continues to teach and research at Cambridge. All tracking and reports for students in Years 7 - 11 are now issued in Firefly.